Welcome back to the Thistle & That blog! In our last post, we gave you seven tips for decorating your Dallas wedding on a budget. There are many ways to create a beautiful space for your wedding that doesn’t have to break the bank. One way to do that is to use wholesale fresh flowers and DIY wedding flowers! Read our last blog post to learn more about decorating for your wedding or visit the Thistle & That website to find out more about the wholesale fresh flower services that we provide and the classes with David Kimmel that we offer so you can create beautiful arrangements for your wedding. For those brides in the Dallas area who are considering DIY-ing their wedding decorations, there is a debate between using fresh flowers or silk flowers for their wedding. Today, on the Thistle & That blog, we are looking at the pros and cons of silk flowers. It’s easy to assume that silk flowers are always going to be the cheapest option for your wedding budget, but that isn’t always the case. However, they do offer their own set of benefits. Do you, your fiance, important people of your wedding party, or family have extreme allergies to certain flowers or to any living thing with pollen? If so, then it might be better to opt for fake flowers. Fresh flowers are beautiful, but a sniffly, runny nose on your wedding day isn’t. Are you planning to use your wedding flowers for another event or for decorating your home? Then you will want to invest in fake flowers. However, pressed, dried flowers can be beautiful as well! In some cases, fake flowers are more lightweight than real flowers, making your bouquet and other decorations easier to assemble and lighter to carry. Flowers — along with everything else — can be one of the most expensive elements of your wedding. Between florist costs and the cost of the actual flowers themselves, you can be looking at several hundred if not thousands of dollars. Fake flowers, depending on the quality of the flowers can be much cheaper. Fake flowers can actually become damaged easily if they are moved a lot. The main concern is that they will fray or parts of them will fall off. As you assemble your wedding decor, you must take care of your flowers! 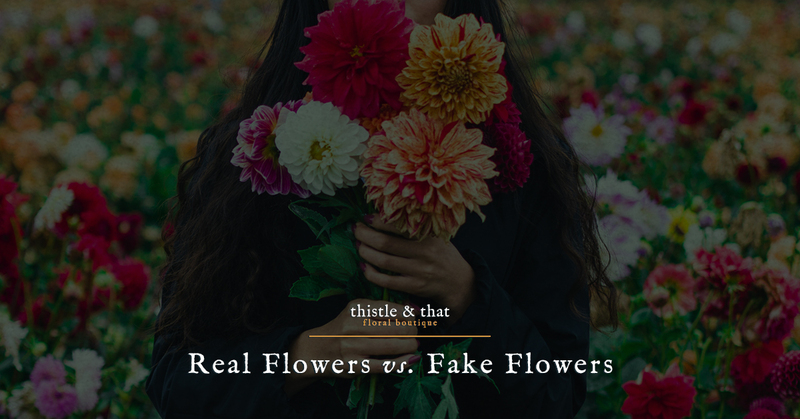 Unfortunately, depending on the quality of fake flowers, they might, well, look fake, and on your wedding day you don’t want anything to look fake. To avoid your bouquet looking like a five dollar deal from Hobby Lobby, if you choose fake flowers, you must use higher quality fake flowers. If you invest in higher quality fake flowers that resemble real flowers, they . . . Yes, you read that correctly. Fake flowers that look like the real thing can actually be more expensive than real flowers. So, what is a bride to do? A compromise might be in order, and we at Thistle & That can provide just that. Our world-class florist David Kimmel provides online classes on the fresh flowers of your choice and can supply wholesale fresh flowers for your big day. When you choose to DIY your wedding flowers with us, you cut out the cost of a florist, while still getting beautiful floral arrangements. Learn more about our wholesale fresh flowers and online DIY classes on our website, and stay tuned to learn more about the pros and cons of fresh flowers.